In anticipation of Monday's official announcement regarding Steam for Mac, AppleInsider spoke with John Cook, director of Steam development at Valve, about the process of porting the online gaming system to the Mac, and the role Apple played in its development. Valve revealed that it would bring its games powered by the Source engine to the Mac, including Half-Life 2, Left 4 Dead 2 and Team Fortress 2. Steam users who own games for the PC will be able to download and play the same games available on the Mac for free, and the new "Steam Play" feature will allow gamers on both Windows and Mac OS X to play online, with or against each other, regardless of their system. Can you share anything regarding timeframe for release, pricing of games, or performance requirements? Cook: The Steam client and native implementations of our games will ship in April. We expect a number of third parties will release their games at the same time. Each game will have its own performance requirements in terms of CPUs, memory, and graphics and we expect they will be comparable to running on Windows. The Steam client itself is very lightweight. The first game from Valve that will ship simultaneously on the Mac will be Portal 2 this holiday season. Our future games will ship simultaneously on the Mac. 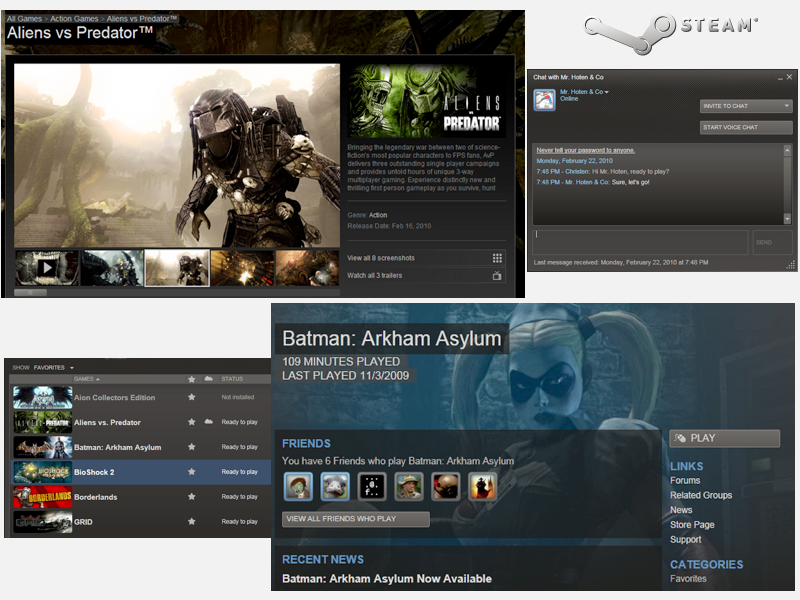 Will existing Steam users have to re-purchase games for the Mac if they already own them for PC? 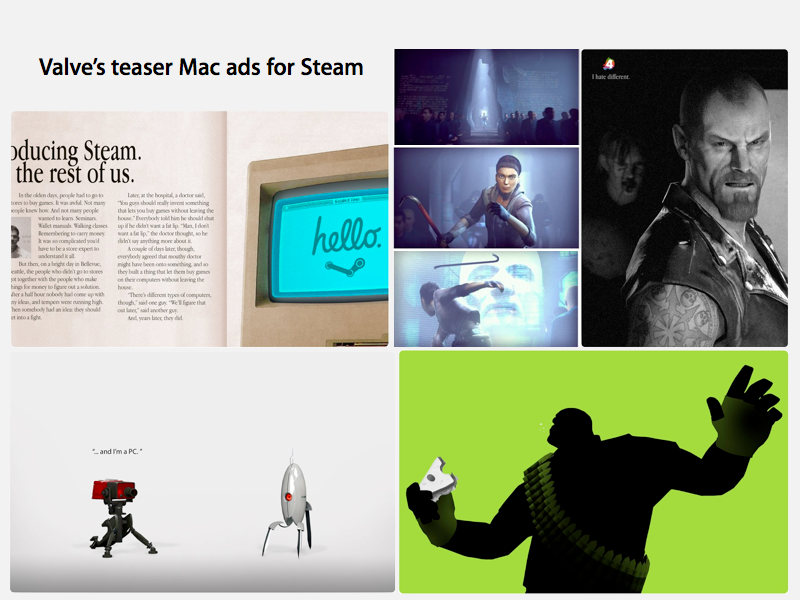 Cook: We are using a featured called "Steam Play" which will allow Mac gamers to play against PC gamers and —for our games and any of our partners who are interested in using the feature —be able to obtain any game they purchase on either system without the need to purchase two copies. So, for example, if you already own Left 4 Dead 2 on the PC you won't need to purchase it again for the Mac. Have you been working with Apple, or received any help from them? Cook: Yes, we've been working with them a bunch as we get more acquainted with their platform. They've been a great partner so far and we look forward to growing our relationship with them over time. What prompted the decision to support the Mac after Valve has for years been outspoken about its frustration with Apple? Cook: As an industry we are going through a transition of entertainment as a product to entertainment as a service. This places a bunch of requirements on the platforms - specifically being an open, high-quality Internet client. The recent announcement of Portal 2 that was done in cooperation with the Steam community is a good example of that. The Mac is a very attractive platform for entertainment as a service. Any projections on what percentage of sales the Mac could represent? Cook: OVER 1 MILLION DOLLARS! Our projections for Steam sales on the PC were horribly wrong. So, we'll just work diligently, skip the predictions (and embarrassment of guessing incorrectly), and see what happens. One thing for certain is that the Mac market will be a lot less of a mystery to the game industry as we add Mac hardware statistics to our ongoing hardware survey (store.steampowered.com/hwsurvey/). What do you think of Apple's choice of graphics hardware? How well does the company keep up with the latest graphics technology for games? Cook: As we have extended Source, our game engine, to support OpenGL, we have been working with Apple and the GPU suppliers to make sure we take full advantage of their capabilities. We have also been giving them feedback on opportunities to extend OpenGL to better support our games as well as the third party games that will be coming. The hardware itself is very familiar to us. Obviously gamers and game developers want the absolute fastest graphics hardware and CPUs, which is why game machines have the highest ASP of any category. Have the iPad or iPhone played any role in your decision to embrace the Mac? Any plans to release titles for those platforms? Cook: Right now we're focused on the Mac desktop and notebook platforms.